In large skillet, melt butter over medium heat. Add shallot and garlic and cook until softened, about 3-4 minutes. Add pancetta and cook until lightly browned. Season with salt and pepper. 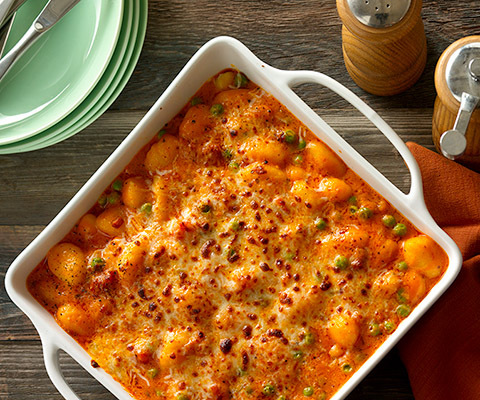 Slowly stir Classico® Four Cheese Tomato Cream Sauce into skillet and add peas. Simmer for 2 minutes. Bring large pot of salted water to a boil. Cook gnocchi until they start to float. Remove gnocchi with a slotted spoon and add to sauce. Stir gently to ensure all gnocchi are covered in sauce. 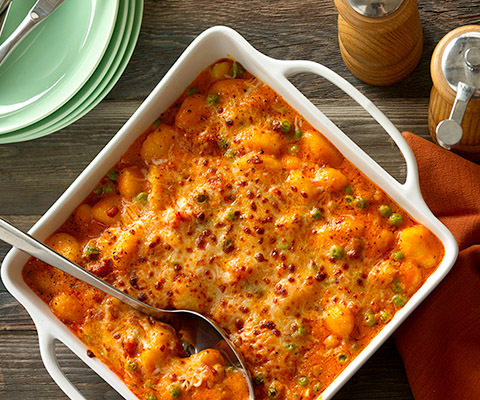 Transfer gnocchi and sauce into 9x9 baking dish and top with mozzarella. Place in oven and broil until cheese is melted and begins to brown, about 3 minutes. Remove from oven and rest for 2 minutes before serving.